This adapter has a 1/4"-20 threaded screw on the bottom and "cold" flash shoe on the top, and is designed for use with an auxiliary flash or accessory. The pictured knurled locking ring affixes this shoe to the device you screw it in to. It is ideally suited for use with any tripod or light stand with a 1/4"-20 threaded socket. Box Dimensions (LxWxH) 5.5 x 3.5 x 1.3"
Accessory Shoe with Tripod Mount is rated 4.3 out of 5 by 10. Rated 1 out of 5 by Vistaphotography from Didn't last very long - plastic gave out I use this with a flash sitting in a pocket wizard shoe. The stress of having flash on top of the pocket wizard shoe caused it to rip the plastic ridges out and it luckily fell into my hand (the flash). It's just not strong enough to hold a 580EX II on top of the wizard hot shoe attachment. Rated 5 out of 5 by Mark from A versatile cold shoe This cold shoe uses a friction clamp to secure the speedlight. It is quick and easy to use. I have found several other brands to be unsecure with my Nikon speedlights. 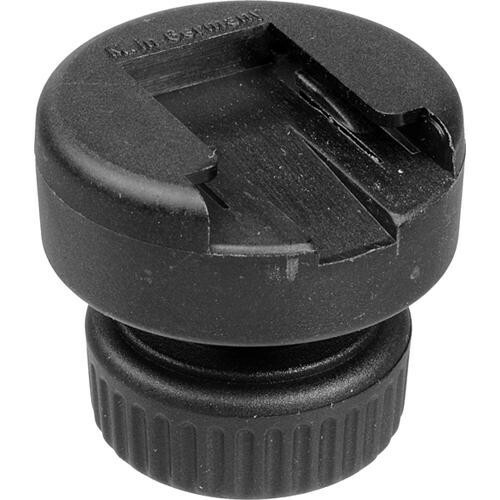 An alternative for Nikon speedlights with locking pins is the SLSN Flash Shoe Mount Adapter for Nikon by Crane. Rated 5 out of 5 by Anonymous from Works as Advertised I wanted to attach a remote strobe to a tripod and this shoe gave me the strobe attachment and a coupler from the hardware store attached it to the tripod. The coupler has a 1/4x20 female thread on both ends. Rated 5 out of 5 by Anonymous from WOW I have two and have them attached to a flash bracket, and that is attached to a monopod. This is used for off camera lighting. Rated 5 out of 5 by Anonymous from Simple, Works as intended, Low Cost Not much to say, it works, it's cheap, solid construction. Easy to loose, so buy 2. Rated 5 out of 5 by Uncle Bob from Just what I was looking for. This is the perfect accessory for using a slave flash along with a tripod. Rated 5 out of 5 by John Spinhirne from Cool little tripod shoe Use it for my remote flash. Works great. Small and simple to use.